This week, KSB joins healthcare organizations across the country in celebrating Cardiac Rehab week. Our team of experienced nurses and technicians work side-by-side with patients, helping them to lead heart-healthy lifestyles. Any time a patient has undergone a cardiac intervention, whether it is an angioplasty or open-heart surgery, cardiac rehabilitation is recommended. 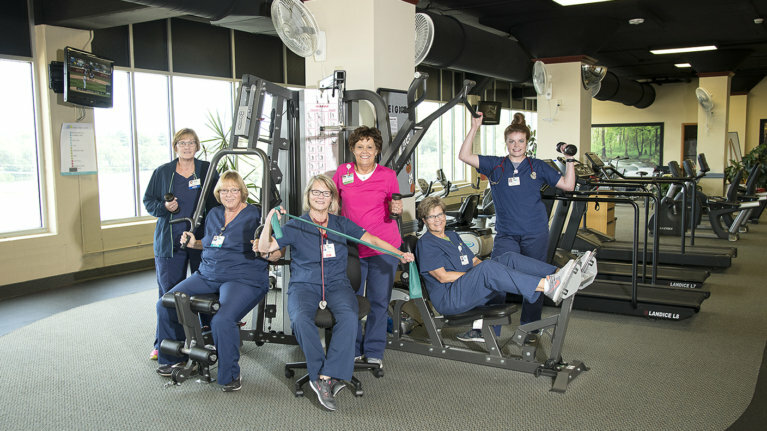 Through cardiovascular conditioning exercises, education, and counseling, our Cardiac Rehab team provides personalized care to patients to improve their strength, stamina, heart and vascular function, and reduce the risk of future hospitalizations. KSB’s cardiac team includes Kelsey Farmer, Sheri Setters, Geri Jensen, Rita Yahnke, Jeff Kimpel, and Chris Schaver who recently sat down for a Q&A session. What do you enjoy most about your job? We like to see the level of improvement and personal satisfaction of our patients from their first visit to their last session, which typically is around 2 – 3 months. We are able to get to know our patients on a personal basis, enabling us to provide a whole new level of care. What is something that may surprise people to know about KSB Cardiac Rehab? We take care of those who have heart attacks, stents, open heart surgery, valve replacements, and transplants. There are two different phases of cardiac rehabilitation. Phase II rehab is for patients who have had recent cardiac events. Phase III rehab involves continuing heart-healthy lifestyles and some of our patients have been with us for over 20 years! Tell us a little bit about what your typical day is like in the Cardiac Rehab department. Our day begins around 5:45 am. We offer supervised, personalized exercise regimens, advice for heart-healthy diets, and support for managing medications. We also provide advice on ways to reduce heart risk factors, like smoking cessation.